Enjoy these features at Eagle Creek Hideaway! - Master suite opens to a screened porch where you can hear the water. - Fire pit next to the fast flowing creek. - wood burning fireplace in main room as well as master bedroom. - Parks on the river. - Free local and long distance calls. 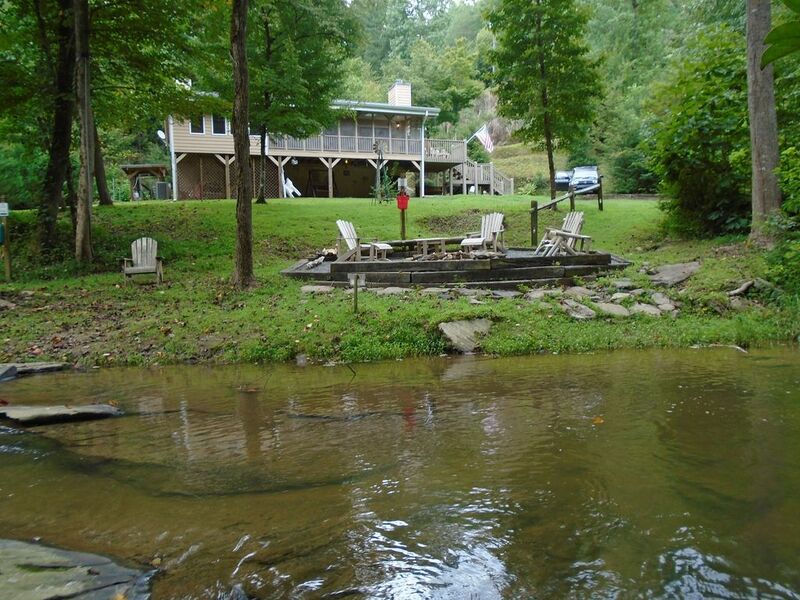 Eagle Creek Hideaway is situated in a private valley and sits right on Flat Creek. You can sit on the screened-in porch and listen to the fast flowing creek, or it is an easy walk down to the water where a fire next to the creek can be enjoyed. There are several benches and a swing along the creek where you can just listen and view nature at its best. Our cabin is a great place to just get away and relax in seclusion. The cabin is decorated with a lot of thought put into the mountain experience. There are hardwood floors throughout. Vaulted wood ceilings with exposed beams and skylights that let in natural light. The master bedroom opens onto the screened in porch, so on cool nights you can open the door and let the sounds of the creek soothe you to sleep. You can kick back with a book, with the only noise you hear is the fast flowing creek and an occasional hawk. Hawks like to catch the updraft from the wind blowing through the valley and over the ridge tops. To stay connected the cabin has complimentary WiFi and Dish network. Of course, staying connected to the outside world is always optional. Eagle Creek Hideaway is located in Coosawattee River Resort (CRR) in North Georgia near Ellijay. CRR is a gated 6500 acre resort that the Coosawattee River flows through. There are many amenities to be enjoyed in CRR while renting our cabin including 3 swimming pools, (2 outdoor and 1 indoor heated pool), game room, large well equipped gym, 18 hole putt putt, tennis courts, basketball courts, stocked fishing pond(no license req). There are several parks along the Coosawattee River with play grounds and picnic tables. Tubing down the Coosawattee River is available daily during the summer. Eagle Creek Hideaway is also a great central location if you want adventure, with easy access to the main road (less than 1 mile from gated entrance) where all the mountain adventures await. Our driveway is paved from the road down to the level parking area for easy access. We strive to make our cabin the most enjoyable experience possible. Please take time to read our reviews. Thanks for looking. We are Gina and Brian and our regular home(when we are not at home at the cabin) is in Fayetteville, Ga. We have a daughter and son in their 20's. We bought this cabin in October of 2011. We love the North Georgia area and particularly the Ellijay area due to the beauty and convenience. It is the closest to metro Atlanta as you can get and still be in the mountains, and in a different world. We fell in love with our cabin when we first saw it. It is in a private valley with a fast flowing creek directly behind the house. It is in Coosawattee River resort with all the amenities you could ask for. Dining room table seats 6. Counter seats 4. Have 2 outdoor pools and 1 indoor heated pool. Gated community, several parks along the Coosawattee River. We enjoyed our stay. The weather was perfect and we were able to explore the creek and resort area. Had a great time! Absolutely beautiful view and feels very private. Will be renting again! We had a wonderful time! The cabin is ideal for hanging out, the yard is awesome with the river at the back, and the location is perfect as a base for adventures. What a great place! Thank you. We really enjoyed our time at this cabin. It's very relaxing to sit by the fire and listen to the river. The house is spotless & exactly as described. Would recommend for any season. It really IS the perfect hideaway. So tranquil & picturesque! There are a variety of things to do, or, just enjoy - being. Ellijay is the historic county seat of Gilmer County, and the Apple Capital of Georgia. Mountain vistas, cold clear rivers, antique shops, and biking. It is the host of the Apple festival each October. Ellijay has the convenience of a super Walmart, Ingles, Food Lion, etc. Dining is also good with Longhorns, Ruby Tuesdays, Shanes Rib Shack, to name a few. There is also almost any fast food restaurant you could ask for such as McDonalds, Wendy's, Sonic, Subway, Hardees, Taco Bell, etc. There are also many local restaurants which are favorites to locals and visitors alike. Ellijay is a good central location for all the activities you look for in a mountain vacation. Carters Lakes is only a few miles down the road with recreation areas for fishing boating, picnicking, playgrounds and swimming. Blue Ridge, Dahlonega, and Amicalola Falls State park are a short distance away. Come and get lost in paradise! 12% Hotel/Motel Tax cleaning fee $95 $200 refundable deposit. $50 one time pet fee.